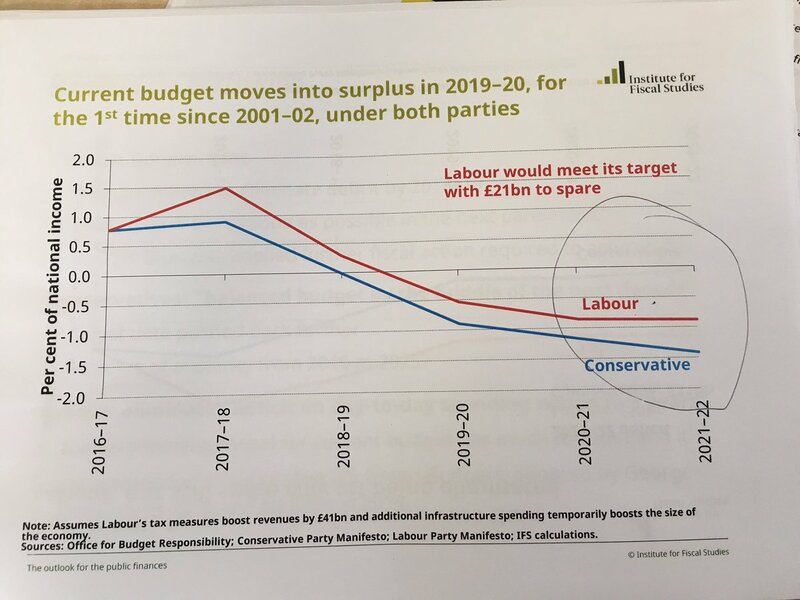 The Institute For Fiscal Studies (IFS) analysis of the Conservative and Labour manifesto proposals, which shows that both parties will run a surplus by 2019/20 , with Labour having £21 Billion spare. The Centre for Labour and Social Studies (CLASS) is a thinktank established in 2012 to act as a centre for left debate and discussion. Originating in the labour movement, CLASS works with a broad coalition of supporters, academics and experts to develop and advance alternative policies. CLASS produces briefings, policy papers and think pieces to influence policy development, which spans a field. Projects already underway address issues of growth and the economy, work and pay, housing and equality, security and aspiration, democracy and welfare, amongst many others. CLASS have produced a comprehensive briefing which breaks down and compares Labour and Conservative manifesto proposals across policy areas including public services, tax, education, employment and Brexit. Here is a summary. I recommend you read the full report here.  Labour states that leaving the EU with no deal would be the worst possible outcome, and reject it as a possibility.  Labour has accepted the end of freedom of movement, meaning that the UK will have to leave the single market.  Labour wants to maintain as many benefits of the single market and customs union as possible.  Labour will scrap the Conservatives’ Great Repeal Bill, replacing it with an EU Rights and Protections Bill that will protect working rights, consumer rights, equality law and environmental protections. The Conservatives have made Brexit a central theme in their manifesto, stating that it is the biggest challenge the UK will face in most of our lifetimes.  The Conservative manifesto maintains that no deal would be better than a bad deal.  The Conservatives have pledged to scrap freedom of movement as a red line in Brexit negotiations. This means that the UK will leave the single market, which is made clear in the manifesto.  The Conservative manifesto pledges a deep and special relationship with the EU, but there are no specific details. Conclusion: Both Labour and the Conservatives have pledged to accept the referendum result, and both parties voted to trigger Article 50 and start the formal process of leaving the EU. However, their priorities in Brexit negotiations are different. The Conservatives’ acceptance that no deal is a possibility for Brexit would have huge implications for the UK economy. We welcome Labour’s statement that leaving with no Brexit deal should not be an option. The Labour party has stated that freedom of movement will end post-Brexit, but have not pledged to reduce immigration.  Labour would guarantee the rights of EU migrants in the UK immediately.  Labour will not set an arbitrary target on immigration levels to the UK.  Labour will reintroduce the Migrant Impact Fund, to ensure that increased migration in certain areas does not place a strain on public services. The Conservative party have pledged to end freedom of movement and reduce migration, claiming that when immigration is too high it is difficult to build a cohesive society.  The Conservatives will not guarantee the rights of EU citizens before Brexit negotiations start.  Despite missing their immigration targets repeatedly while in government, the Conservatives have again pledged to reduce immigration to the tens of thousands -including students. Conclusion: Both parties are committing to ending freedom of movement post-Brexit. This could have serious consequences for the UK – 10% of our doctors and 4% of our nurses are from elsewhere in the EU. It is also concerning to see that students will be included in Conservative immigration numbers. However, while the Conservatives continue to suggest that immigration must be limited, Labour have stated that immigration targets are unhelpful. This is a positive step forward in our national conversation about migration.  Lowering the 45p additional rate threshold to £80k (Top 5%) and reintroducing the 50p rate on earnings above £123k. Raising £6.4bn.  Increase corporation tax to 26% in 2020–21 (2011 levels) with a lower rate for companies with annual profits below £300k. Raising £19.4bn.  Introduce a Robin Hood Tax – a tax of about 0.05% on financial transactions. Raising £26bn.  A clamp down on tax avoidance. Raising £6.5bn. A £3.9bn allowance has been made for behavioural changes and uncertainty.  Increase the personal allowance to £12,500 and the higher rate of tax to £50,000 by 2020.  Cut corporation tax to 17% by 2020.  Conduct re-evaluations more frequently to prevent large changes.  Stop tax avoidance and evasion. Conclusion: Tax is one of the biggest dividing lines between the parties. We welcome Labour’s plan for increased taxes on the rich and bold measures to tackle inequality. We are concerned that the Conservatives plan for a low tax economy would simply mean high earners and corporations gain, while low and middle income earners would see their wages eaten away by inflation.  Extending HS2 into Scotland.  Building Crossrail for the North.  Investment in new, state-of-the-art low-carbon gas and renewable electricity production.  Universal superfast broadband by 2022.  3% of GDP on research and development.  A goal of 60% of jobs created through investment to be high skilled. The Conservatives have also proposed an industrial strategy with major investment in infrastructure, skills and research and development. They plan to continue the existing £170bn infrastructure investment plan over the next parliament. A part of this funding will come from borrowing and part is already allocated in the budget.  Meet OECD average of 2.4% of GDP on research and development.  Launch a £23bn National Productivity Investment Fund. Conclusion: Both parties have pledged to invest in infrastructure and skills. Labour’s measures are more ambitious in outlook and funding, and are more clearly costed. CLASS believes that this big and bold idea brings the investment the UK so vitally needs.  An end to fracking.  Championing sustainable farming, food and fishing by investing in and promoting skills, technology, market access and innovation.  Introduce a new Clean Air Act to deal with illegal levels of air pollution.  Halt the privatisation of public forests.  More fracking, hailing the technique as a “revolution”.  Devise a new “agri-environment system”.  Produce a 25 year Environment Plan.  A pledge to be the first generation to leave the environment in a better state than they inherited it. Conclusion: There are clear dividing lines on the environment, most noticeably regarding fracking, with the Labour party firmly opposed to the industry, and the Conservatives proudly supportive. There is also the matter of Labour’s greater emphasis on environmental protection and clean air, and lack of Tory attention to these issues. Given this divide, we do not see how a Conservative government would be the one to leave the environment in a better state. The Labour party has focused on additional funding for the NHS and social care, stating that cuts to NHS and social care budgets by previous Conservative governments have led those services to crisis point.  Labour has committed to £30bn in extra NHS funding over the next parliament.  Labour has committed £8bn for social care over the next parliament.  Labour pledges to guarantee access to NHS treatment within 18 weeks, and that patients will be seen in A&E within 4 hours. The Conservative party manifesto has pledged to increase NHS spending, while proposing new rules for social care costs.  Conservatives will increase NHS spending by at least £8bn over the next parliament.  The Conservatives propose ensuring that anyone who needs social care will be able to keep £100,000 of assets.  People will be able to defer payment on social care until after their death, enabling them to keep their house. Four days after the Conservative manifesto launch, Theresa May announced that there will be a cap on the amount an individual will pay towards their care, despite the manifesto mentioning no cap and specifying only that no one would be left with less than £100,000 in assets after paying care costs. There has been speculation that a narrowing poll lead led to this announcement, which the Conservatives refuse to describe as a change. Conclusion: We welcome commitments to properly fund the NHS, but Conservative commitments do not equal the missing funding identified by many campaigners, and their figure is less than a third of Labour’s commitment. The Conservative social care proposals are also flawed, as people would be likely to pass on their assets to their children to avoid charges. While four in five councils can’t cope with the demand for elderly social care, Labour’s proposals for a big funding boost would be the better option for social care. The Labour party has pledged to create a National Education Service to reform our education system.  Labour will reverse cuts to school funding.  Labour will increase Sure Start funding.  Labour will create a National Education Service for cradle to grave education, free at the point of use.  Labour will reduce class sizes to less than 30 for all five, six and seven year olds.  Labour has pledged to scrap tuition fees and reintroduce maintenance grants.  Labour has pledged to restore the Education maintenance Allowance (EMA).  Labour will provide free Further Education, including English lessons. The Conservative party has made pledges to increase school funding and make sure that more children attend good schools.  The Conservatives have pledged that no school will have their budget cut as a result of the new funding formula.  The Conservatives will build 100 new free schools a year.  Conservatives will lift restriction on creating grammar schools.  Conservatives will open a specialist maths school in every major English city.  Conservatives will stop universal free school lunches for primary age children, replacing them with free universal breakfasts. The savings will be used for £4bn in schools funding over the next parliament. Conclusion: Labour’s commitment to reversing school cuts should be welcomed – 99% of schools will have per pupil funding cut by 2020 under current government policy.1 The creation of a national education service for lifelong learning is another welcome proposal, enabling people to retrain in a fast changing jobs market. However, we were disappointed to see another commitment to new grammar schools from the Conservatives, with a pledge to lift restrictions on the creation of new selective schools. As we have highlighted before, there is no evidence that shows grammar schools increase social mobility – it actually shows the opposite. The Conservative party state that they have no plans for further radical welfare system reform in the next parliament. The Conservatives will therefore continue to roll out universal credit.  Scrap the bedroom tax.  Scrap punitive benefit sanctions.  Scrap the Work Capability Assessment.  Scrap cuts to bereavement support.  Restore housing benefit for under 21s. Conclusion: After several years of cuts to benefits, and numerous examples of suffering caused by those cuts, it is disappointing to see no changes to the welfare system proposed by the Conservatives. However, we should welcome commitments by Labour to scrap some of the worst features of recent welfare reforms.  Give all workers equal rights from day one, whether part-time or temporary.  Ban zero hours contracts.  Legislate to ensure that recruitment of labour from abroad does not undercut workers at home.  Repeal the Trade Union Act and roll out sectoral collective bargaining.  Maximum pay ratios of 20:1 in the public sector and in companies bidding for public contracts.  Raise the Minimum Wage to the level of the Living Wage (expected to be at least £10 per hour by 2020) – for all workers aged 18 or over.  End the Public Sector Pay Cap.  Action on bogus self-employment so the law assumes a worker is an employee unless the employer can prove otherwise.  Double paid paternity leave to four weeks and increase paternity pay.  A statutory right to a year’s unpaid leave to care for a relative.  EU workers’ rights protected.  Protection from the gig economy.  Improve worker representation on boards – watered down from previous commitments to have workers on boards.  A right to training. However, the Conservatives have weakened their National Living Wage commitment to meet 60% of the median wage by 2020. With rising inflation, this is likely to cause increased poverty among low earners. Conclusion: Although this is one of the Conservative party’s more worker friendly manifestos, Labour’s finger is definitely more on the pulse when it comes to workers’ rights. Labour’s manifesto has a real potential to tackle the deep inequality that the UK suffers from.  Labour will assess future policy for its impact on women.  Bring offences against LGBT people in line with hate crimes based on race and faith.  Labour will introduce a requirement for equal pay audits on large employers to tackle the pay gap faced by BME workers.  Labour would classify British Sign Language as a recognised language. The Conservative party had a particular focus on disability discrimination.  A one year national insurance holiday for companies who employ a person with a disability.  The Conservatives will continue plans to tackle hate crimes against a person based on their sexual orientation, gender identity, disability and religion.  The Conservatives will review access for disabled people and pledge to work with service providers to reduce any extra costs faced by people with disabilities. Conclusion: Labour have proposed concrete policies to help improve equalities in the UK. Although the Conservatives have clearly stated a commitment to people with disabilities, this is in the context of cuts to benefits under a Conservative government which have had a disproportionate impact on people with disabilities.  Build 100,000 council and housing association dwellings for every year of the next parliament.  Build more affordable housing.  Make three year tenancies the norm.  Abolish the bedroom tax.  Inflation capped rent increases, and a ban on letting agent fees.  New minimum standards introduced for the private rental sector.  Reinstate housing benefit for 18-21 year olds.  A plan to end rough sleeping within the next Parliament, with 4,000 additional homes for people with a history of rough sleeping.  A promise to deliver on their 2015 manifesto commitment to build a million homes by 2020, and a pledge to built another 500,000 homes by 2022.  A new generation of fixed-term council housing linked to a new Right to Buy.  Free up more land for new homes.  Give housing associations more flexibility to increase their stock.  Give councils more power to intervene when developers don’t act on planning permissions. Conclusion: We are happy to see commitments from both parties to building large numbers of houses, though this does reflect how bad the crisis has become. We call on both parties to commit to building 200,000 social houses to meet demand. We applaud the multiple new protections for renters from Labour, and are concerned with the lack of firm policy commitments from the Tories.  Keeping the triple lock on pensions, so the state pension rises by 2.5%, inflation, or earnings growth.  Commission a new review of the pension age, to develop a flexible retirement policy reflecting people’s contributions, the variations in life expectancy and the varying health effects of work.  The Winter Fuel Allowance and free bus passes will be guaranteed as universal benefits.  Protect pensions of UK citizens living overseas.  Means testing the winter fuel allowance (potentially affecting 9m pensioners).  Change to a double lock on pensions, so they go up in line with earnings or inflation, whichever is higher (removing the third 2.5% lock).  Measures to protect private pensions by increasing punishment for mismanaging schemes. Conclusion: We are happy to see commitments from both parties to building large numbers of houses, though this does reflect how bad the crisis has become. We call on both parties to commit to building 200,000 social houses to meet demand. We applaud the multiple new protections for renters from Labour, and are concerned with the lack of firm policy commitments from the Tories. The Labour party has pledged to prioritise public service over private profit, and stated that prices have risen and services have suffered in privatised industries.  Renationalise railways by bringing them back into public ownership as franchises expire.  Establish publically owned regional water companies. The Conservative party have pledged to take action on rip-off bills.  Pledge to freeze energy bills, a policy that was also in the 2015 Labour manifesto.  Pledge an independent review into energy costs.  Pledge the largest investment in railways since the Victorian era and extra capacity to tackle overcrowding. Conclusion: Labour have made it clear that privatisation of public services, all natural monopolies, has not worked. We should welcome the commitment to nationalise industries to make them accountable to the public who use them, and with the aim of reducing prices. The Conservatives have made no pledges on nationalisation, but have promised rail investment. It is unlikely that investment alone could tackle the issues facing our railways.